Obstetric ultrasound scanning is an ultrasound imaging method designed to be used to augment physical examinations in the course of prenatal care. There are a large variety of uses for obstetric ultrasound, and this procedure has become a routine part of prenatal care for many women, especially women throughout Europe and North America. It has become quite common for parents to request print-outs of the images of their growing infant and the technician frequently prints out pictures for them to see and explains the fetus’s configuration as seen on screen to the parents, during the course of the obstetric ultrasound scan. In obstetric ultrasound imaging, high-frequency sound waves are bounced off the body to create an accurate image of the inside of the uterus. Very high frequency sound waves of between 3.5 to 7.0 megahertz (3.5 to 7 million cycles per second) are normally used for this purpose. This is achieved by using a transducer which emanates waves and generates an image based on the length of the response time and the changes in frequency. The obstetric ultrasound results created can be either a still or moving image, with advanced technology being implemented to create three-dimensional ultrasound images which provide even more specific details. The obstetric ultrasound image may be acquired by covering the woman’s abdomen in a conductive gel and running the transducer along the belly, or by inserting the transducer into the vaginal canal to get a clearer image, which is known as a transvaginal ultrasound. The resulting image gives a picture of the uterus and its contents, along with adjacent body structures. These measurements outline the foundation in the assessment of gestational age, size and growth in the fetus. A full bladder is often compulsory for the procedure when abdominal scanning is done in the early stages of pregnancy. There may be some discomfort from pressure on the full bladder. There are a wide variety of uses for obstetric ultrasound. 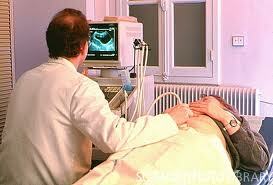 Obstetric ultrasound imaging is customarily used to evaluate a pregnancy. This may include determining how far along the pregnancy is and confirming that the fetus is developing normally. Movements such as fetal heart beat and abnormalities in the fetus can be appraised and measurements can be made accurately based on the images displayed on the monitor. An ultrasound can also be used specifically to check for fetal malformations or problems, including a detached placenta. If a mother comes with pregnancy complications indicating fetal distress, obstetric ultrasound may be used as a diagnostic tool to check on the status of the baby without having to use invasive techniques which could jeopardize the pregnancy. As there are various obstetric applications, different types of obstetric ultrasound probes are required, depending on which is indicated. If an obstetric ultrasound scanner model has fixed probes, then it may only be suitable for a limited subset of applications. For this reason, it is common for ultrasound systems to have interchangeable probes, and they frequently have more than one probe connection socket for the different applications.